Embolic Protection Devices Market size was valued over USD 870 Million in 2016, with growth forecast over 10% CAGR from 2017 to 2024. Embolic protection devices market is set to gain traction over coming years due to incessant rise in geriatric population globally coupled with increasing prevalence of cardiovascular diseases. Various clinical trials have proved the effectiveness of these devices to prevent emboli during stenting procedures leading to rise in demand for embolic protection devices. Citing this, manufacturers are developing and packaging embolic protection devices and carotid stents together. Rising aging population all over the world has led to an increase in number of medical conditions such as cardiovascular diseases. Cardiovascular diseases which include heart attacks, strokes, carotid and coronary artery diseases, as well as peripheral vascular diseases are identified to be a leading cause of premature death in the world. The number of cardiovascular diseases deaths reached to more than 17 million in 2013 from 12.3 million in 1990. This rising trend is predicted to continue in the coming years generating huge demand for disease treatments. The rise in the number of TAVR (Transcatheter Aortic Valve Replacement) procedures is another pivotal factor expected to significantly contribute to the embolic protection devices market growth. The number of approved TAVR centres in the U.S. has increased tremendously from 156 in 2012 to 511 in 2017, while approximately 35,000 patients underwent TAVR in the U.S. in 2016. A number of clinical studies suggest occurrence of brain injury in patients undergoing TAVR procedures. This has generated the need to use embolic protection devices during TAVR procedures. Incessant technological innovations in embolic protection devices should also offer potential market growth avenues. The devices are witnessing advances in terms of design and usage profile to better suit the procedure under consideration. Recently, embolic protection devices are specifically engineered to improve the safety and effectiveness of carotid artery stenting procedure. Further advances in device have provided access through radial artery as an alternative approach to traditional femoral approach for carotid artery stenting. Apart from this, preference for minimally invasive surgeries has positively affected embolic protection devices market. Various medical facilities now prefer minimally invasive procedures due to advantages it offers as well as advancements in imaging technologies. This has led to an expansion in the patient base for treating carotid and coronary artery diseases, and peripheral vascular diseases. Physicians offer minimally invasive surgical treatments such as stenting procedures and angioplasty which require small incisions. For instance, carotid artery stenting has become an increasingly reasonable alternative to carotid endarterectomy. This aids in reducing pain and trauma, minimizes parallel infections as well as hospital stay, and requires less recovery time. Moreover, expert studies have revealed the usage of embolic protection devices in new applications such as lower extremities and atherectomy procedures. Embolic protection is necessary since emboli in lower extremities can also get trapped in the narrower arteries affecting the blood flow to the respective part of the body. This has generated the need to expand research and development in the areas of embolic protection devices for lower extremity stents. However, factors such as low reimbursement for stenting procedures in certain countries, and presence of alternative treatment options such as endarterectomy and usage of drugs to treat medical condition may limit the growth of the market. Apart from this, embolic protection devices may witness downward pricing pressure due to competition among industry players and introduction of advanced technologies. Distal filters dominated the overall embolic protection devices market accounting for largest market share in 2016. The availability of these filters in wide variety of specifications has led to its popular usage. Moreover, these filters are easy to deploy, maintain antegrade blood flow, and do not interfere with lesion visualization. Distal occlusion systems market will witness robust growth during forecast timeframe. These devices offer advantages such as minimal landing zone for occlusion balloon, and low crossing profile. Proximal occlusion systems have evolved recently and expected to grow at a CAGR of over 8% during forecast timeframe. Carotid artery diseases accounted for the largest share in overall embolic protection devices market in 2016, followed by coronary artery disease. Embolic protection devices are most widely used for stroke prevention during carotid artery stenting procedure. The increasing prevalence of cardiovascular diseases due to rising trend of aging population is set to propel the segment growth. Peripheral vascular diseases should also witness positive growth trajectory over the forecast period due to rising awareness regarding treatment of these diseases employing minimally invasive procedures. U.S. accounted for the largest regional share in the North America market. A large patient pool with cardiovascular diseases, rapid technology adoption and increasing preference of physicians for minimally invasive procedures should drive the market growth in this region. Germany dominated the Europe embolic protection devices market in 2016 owing to high prevalence of target diseases and increase in number of TAVR procedures. 13,264 TAVR procedures were performed in Germany in 2014 for a population of 81 million. The increasing geriatric population of China should drive embolic protection devices market in this region. The rise in aging population has led to increased prevalence of cardiovascular and neurovascular diseases in this region. China’s population aged 60 and above surpassed 220 million by the end of 2016, making it the only country in the world with geriatric population of over 200 million. 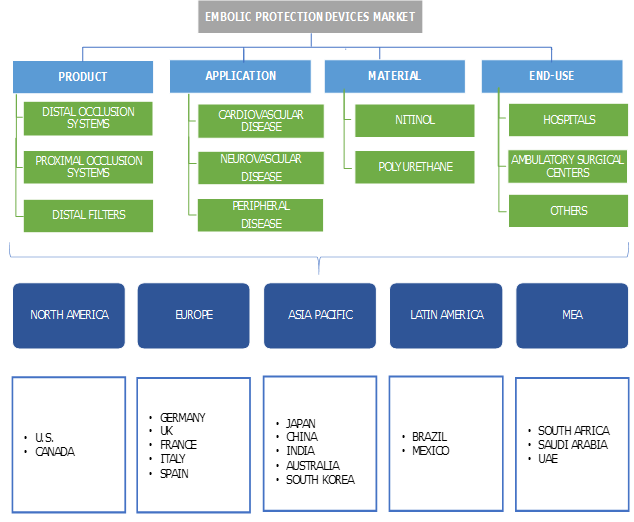 Abbott Laboratories, Cardinal Health, Medtronic, and Boston Scientific are the major players in embolic protection devices market. Other notable players include Gore Medical, Claret Medical, Allium Medical, Innovative Cardiovascular Solutions, Edward Lifesciences, and Transverse Medical among others. The major strategies adopted by the market players include new product launches, mergers and acquisitions. The firms are striving to expand their presence globally in order to compete in the dynamic market. Embolic protection devices industry is guarded by stringent regulatory framework. The U.S. FDA has classified these devices as Class II (moderate-risk devices). Hence these devices require FDA clearance through the Premarket Notification [510(k)] process marketing. The regulatory body tests the performance of each device with respect to safety and effectiveness in the patients intended for use before its premarket approval or 510[k] clearance is granted. The devices’ possible associated risks should be less than probable benefit in order to be marketed for its use. It is mandatory that device labelling must reflect cleared/approved indications regarding patient population studied as well as its use with other devices such as stents. The EPD label must contain the type of stents used during clinical study that obtained market clearance.